Whole raw clementines—juice, fruit, peel, and pith—go into this cake for tons of bright and sunny flavor. The polenta adds a lot of texture here; cornmeal will keep things interesting without quite so much grit, if you prefer. I like this cake without the glaze, but my sweet tooth could use some development, and the glaze turns this otherwise coffeecake-like cake into a real dessert (or so my resident eaters tell me). You can easily add a sophisticated twist by replacing the juice in the glaze with whatever wine you use in the batter for a lightly boozy touch. Have clementines but not in the mood for cake? Check out this Clementine Salsa. Preheat an oven to 325°. Coat a 10-inch spring-form pan with cooking-oil spray. Cut a piece of parchment paper to fit in the bottom of the pan, place it in the pan, and spray the paper with oil. Cut the clementines in half. Remove and discard any seeds (clementines should be seedless, but life is full of myriad mysteries). Juice 6 of the halves and reserve the juice (you should have about 1/3 cup). Roughly chop the shells and remaining clementines, reserving as much juice as possible. Whirl the chopped clementines in a food processor until they turn mostly smooth. There will still be visible little bits of orange peel. Set the purée aside. In a large bowl, beat the eggs and sugar together until the mixture turns a paler yellow and thick ribbons of the mixture will sit on top of the batter for a moment when you lift the whisk out of the bowl. Stir in the olive oil and wine. Stir in the clementine purée, then stir in the cornmeal. In another bowl, combine the flour, salt, baking soda, and baking powder. Add the dry ingredients to the wet ingredients and stir gently just to combine everything. Pour into the prepared pan and bake until it's brown on the edges, golden brown across the top, the edges pull slightly away from the pan, and a cake tester inserted in the middle of the cake comes out clean, about 1 hour. This is a dense batter, and you want to make sure it's baked through. Let the cake cool 10 minutes. Remove the sides of the pan and use a long spatula to gently transfer the cake from the pan to a cooling rack (slip the spatula under the parchment paper and transfer the paper along with the cake). 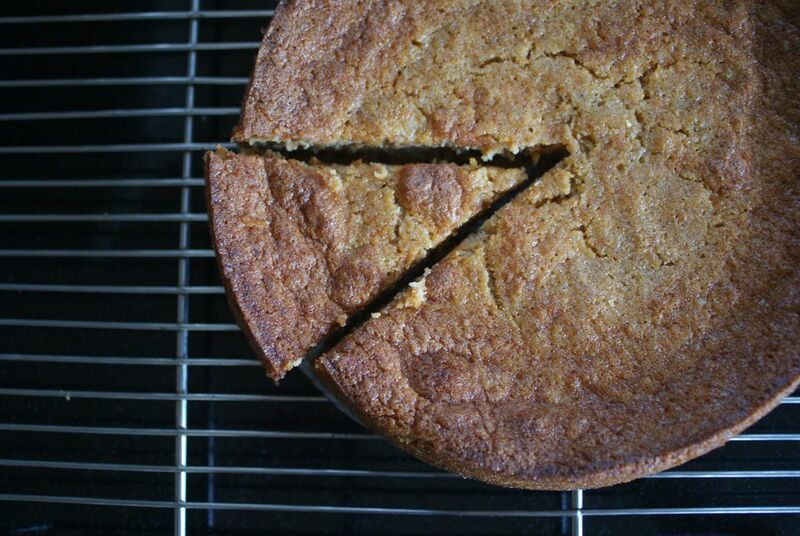 Let cake cool completely before slicing. A Venezuelan Sandwich Made with Plantains Instead of Bread!